This is a collection of my best images. The Sukhoi Su-35 (Russian: Сухой Су-35; NATO reporting name: Flanker-E]) is a heavily upgraded derivative of the Su-27 'Flanker. While the aircraft maintains a strong superficial resemblance to the Su-27, the airframe, avionics, propulsion and weapons systems of the Su-35 have been thoroughly overhauled. Technological advancements have produced more compact and lighter hardware, such as the radar, shifting the centre of gravity to the aircraft's rear. These improvements removed the need for canards (Su-30) and saw the abandonment of the "tandem triplane" featured on several Su-27 derivatives. Also omitted was the Su-27's dorsal airbrake, which was replaced by differential deflection of the vertical stabilizers. Other aerodynamic refinements include a height reduction of the vertical stabilizers, a smaller aft-cockpit hump, and shorter rearward-projecting "sting". The thrust vectoring nozzles operate in one plane for pitch, but the canting allows the aircraft to produce both roll and yaw by vectoring each engine nozzle differently. A similar thrust vectoring system is also implemented on the PAK FA. The engine gives the Su-35 limited supercruise capability, or sustained supersonic speed without the use of afterburners. 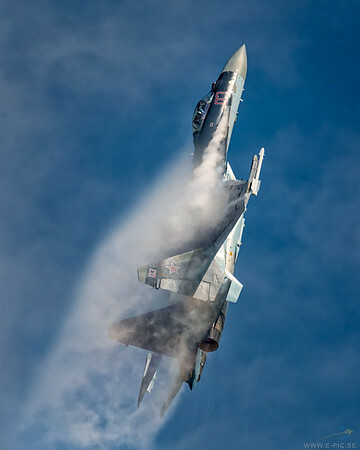 Radar-absorbent material is applied to the engine inlets and the front stages of the engine compressor to halve the Su-35's frontal radar cross-section (RCS); the canopy was also modified to deflect radar waves.